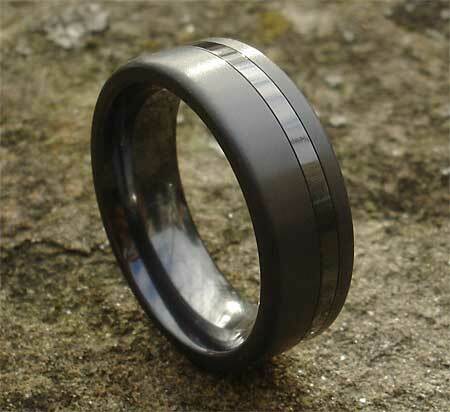 Men's Twin Finish Black Wedding Ring : LOVE2HAVE in the UK! This men's wedding ring in black zirconium features a twin finish combination of matte finishing with an off-centre stripe. The definition between the two finishes looks excellent and therefore makes a fantastic choice for an alternative black wedding ring. 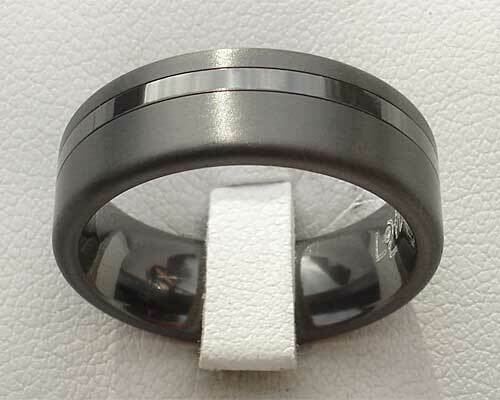 Its profile is flat, and it comes in a 5mm and 7mm width, so couples looking for something alternative in black rings need look no further. The 7mm version is pictured here, and we are sure that even wider widths would be available also so, please do email us for details if you are interested in this option. Two grooves sit precisely on either side of the stripe making up part of the design too, and the edging has a nice smoothed off quality. Width(s) Available: 5mm and 7mm.